Let’s figure out the right size dog crate for you! Nearly half of all homes in the U.S.A. contain at least one person and at least one canine. The use of a dog crate is very common in these homes. These co-habitations tend to start off well enough. After all, if we didn’t love dogs, we wouldn’t want them to live with us in our homes! In other words, it can be hard enough to co-habitat with an undisciplined, untrained human companion, yet alone one from a different species! Could some – maybe many – of these relinquishments have been prevented? The majority of dog training experts say YES. In particular, crate training can prevent people’s frustration from boiling over. Raising a happy, healthy, well-socialized member of the family is a lot of work. 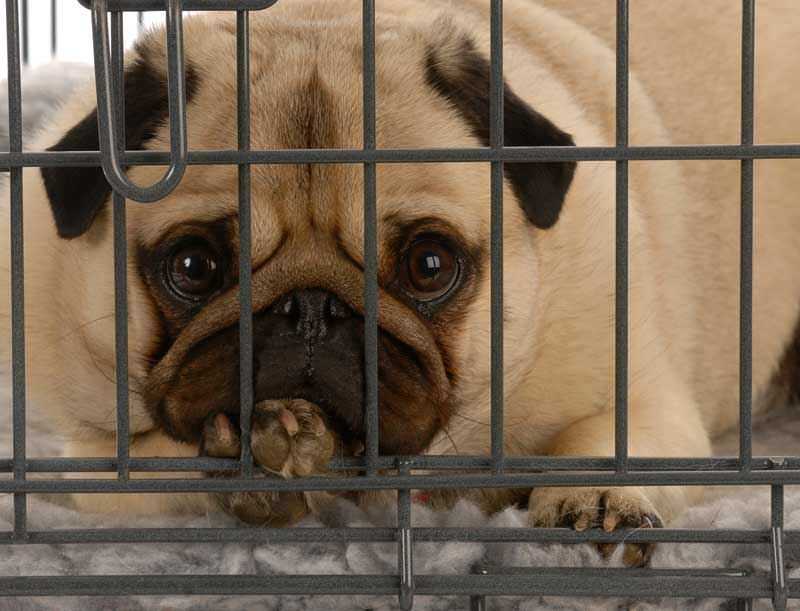 Crate training can prevent the hard choice to release your pet for re-adoption. a fantastic idea and I’m glad you’re here! A crate is the modern domestic answer to your dog’s innate wild need for a safe space that is all her own. 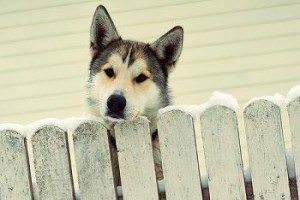 In this way, dog is to wolf as crate is to den. Wild canines (aka wolves) do two critical things in a den: sleep and whelp out wolf cubs. A den is typically a shallow dirt dugout the wolf digs for herself. Often it is located in a secluded area where it can be securely covered with low-hanging tree branches, fallen leaves and other debris. If you can imagine the wild wolf inside her den, you would be visualizing a narrow, warm, dark space where she feels totally safe and secure. If she wants to stand up, turn around or stretch out flat to lay down, there would be just barely enough room to do so within the confines of her den. Contrary to the arguments of modern “crate = cage” opponents, a crate will ideally serve in a similar way for your domestic, captive dog. She will have a place that is quiet, warm, dark and secure that is for her and no one else. will make the “training” part of crate training much easier. Wolf cubs learn everything they need to know from their mothers – starting with the association between a den and a safe place to hide or sleep. Cubs learn quickly not to soil their sleeping area – if they need to go, they go outside their den. Cubs also learn to be quiet and calm while inside their den so predators will not hear them. And female cubs learn to make dens of their own when they are pregnant (which is the topic for another post and a similar den-like structure with a few extras called a “whelping box”). Crates appeal to natural instincts. The training part for a domestic canine, or puppy, is to rekindle these ancient innate associations through crate training (here, the “crate” is also often called a cage or kennel). Crating a dog is both easiest and best accomplished when a domestic dog is a puppy. It is easier to train a puppy that hasn’t become set in her ways and because many puppies come to their forever homes during a developmentally fearful time. Typically, during this time, the crate is a welcome, private space for them. But crate training adult dogs is totally possible – even if your new pup is suffering from a case of “crate hate” or if he has never seen a crate before. When you are shopping for a puppy-sized dog crate, there are two options to consider. The first option is to buy an economical (read: good value) crate your puppy can use while he is little. Then pick out a “forever dog crate” for him when he reaches his full adult size. The second option is to buy a dog crate that comes with dividers so you can open up more space inside as your puppy grows. In this way, you can buy just one crate rather than two. What you decide may depend on how large your puppy is expected to grow! For example, if you have a Great Dane puppy, the size of the dog kennel your puppy will need at his full adult size may not be sufficiently customizable. Even if you have dividers, it may not feel cozy enough for a little puppy. Dividers can enable you to only need one kennel as your dog grows. But if you have a small breed puppy, it is likely you can even get away with making your own “dividers” out of blankets or empty shoeboxes so your puppy can keep his same crate as an adult. In general, you want to select a puppy cage that is no more than 6 inches higher than your puppy is at full standing height. You want the crate to be no more than 6 inches longer and wider than your puppy is when stretched out to full length and width. These restrictive-sounding measurements cater to your puppy’s innate tendency to feel most secure. It is a small, quiet, dark, warm space – the den space you are aiming to mimic with the puppy crate. many of us have used Petmate kennels. for your puppy, this is a great choice. as fun as possible for your puppy. Petmate’s Doskocil Compass Kennel is a versatile small breed puppy/dog kennel accommodates puppies up to 10 lbs. It comes in basic black and 3 fun colors: hot pink, island blue and red plum. The assembly is simple and quick and the two-way latch is secure and easy to operate. This kennel will also permit for staged crate training (where you use just the bottom half first, then add the top and then the door) to ease anxieties in nervous puppies. 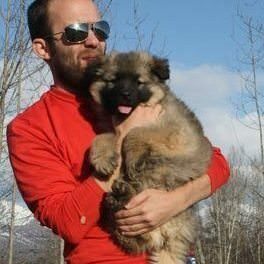 Remember, be as positive as possible and make crate training fun for your puppy. This will really help in making your puppy comfortable with their new crate as quickly as possible. 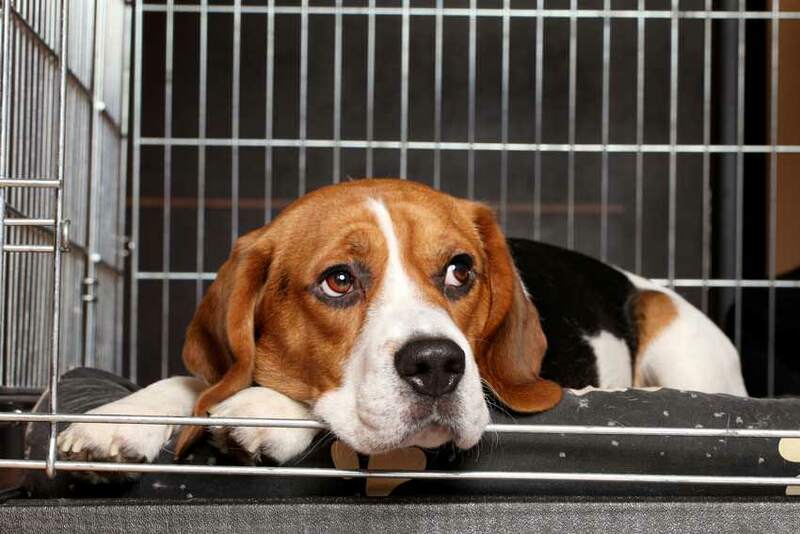 Your attitude towards your puppy’s crate will have an effect on their attitude towards it. and make it easy to take your puppy with you. 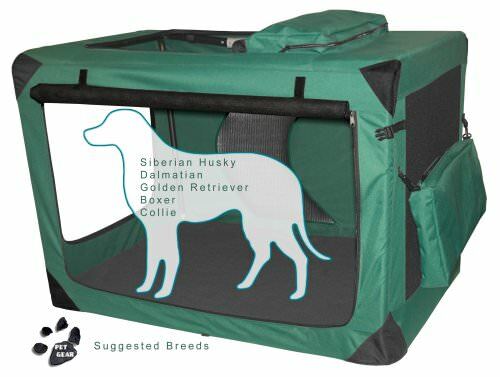 As a soft side portable puppy kennel for limited use, this kennel fits the bill in all the major ways. It comes in 5 sizes (from x-small to x-large) and 6 fun colors. There is a removable waterproof mat that is simple to clean. One of the differences in this crate and many puppy crates is that it has an underlying steel frame which makes it safe enough for car travel. It offers 3 entry-exit doors (top, side, front). It is lightweight and folds up easily to store. As a limited use soft side crate for your new puppy, this crate will keep your puppy safe, warm and dry at home or on the go. We think that Pet Gear did an excellent job in designing and manufacturing this crate. soft sided crate, this is a great choice. which are definitely bonus points in our book! If your new canine companion is a puppy, he still has some growing and developing ahead of him. The most notable part of this is potty training. Your puppy won’t be able to fully master his bladder and bowel function until around 1-year of age when his GI and elimination systems mature. How does this apply to choosing a crate? You want the crate to be small enough overall that your puppy cannot conceive of being able to do his business at one end while still sleeping comfortably at the other. This is in the spirit of the “never soiling where you sleep” lesson. The most sanitary crates are usually made of wire. Food-grade plastic crates can be good for short-term use. Over time, if your puppy has scratched or teethed on the plastic, the grooves harbor bacteria if not cleaned very carefully. Because of potty training and bladder/bowel control issues, soft side crates are best reserved for short trips to the vet. They are also great for trips to the groomer or to provide shade during park outings. Also, some of the newer soft side crates are easier to clean with a new wash-and-wipe technology. Crating dogs as adults operates on the exact same principles as crate training a puppy – only the measurements will change. Of course, if you get your pet dog as an adult, you will be selecting a crate for his adult size. This can be a lot easier than selecting a crate he can use as a puppy AND grow into as an adult dog! As well, since your adult dog will already be housetrained, you won’t have to make crate decisions based on the same factors as a puppy crate. How easy the crate is to clean or whether the crate comes with a pull-out tray or inbuilt moat are not as important. but using a crate helps keep dogs safe! Remember the guidelines for crate size. Here, the same sizing guidelines apply. Your dog should be able to easily stand to full height, sit down and lay out to full length with no more than 6 inches to spare (less if you will also use the crate for car or air travel). 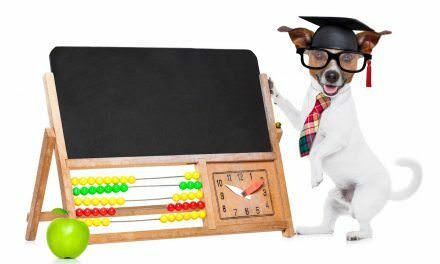 Some breeders and many crate manufacturers offer a sizing chart to give you a better idea of what size dog kennel will best fit different sizes and breeds of dog, and this can also be helpful when choosing a dog crate. If you are still unsure, asking your breeder, the rescue shelter or your family vet is always a good idea. Here you may be thinking, “smaller?! – but my dog’s regular crate is already the size of a dog closet!” And this is precisely the point. In the wild, a wolf’s den is a confined space for reasons of safe shelter. It is easier to remain out of sight and warm in a smaller space. 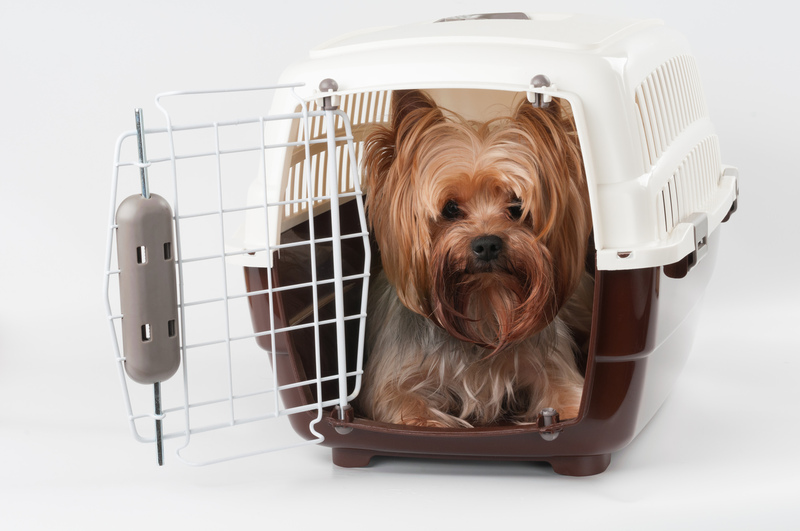 Your pet is likely to feel less secure during travel than when at home in the relative safety of familiar surroundings, so the smaller dog crate size will help here as well. During traveling, whether by car, air or other means, jostling and bumping during the journey can injure your dog. For the same reason humans wear seatbelts, your dog should be offered a crate that fits her almost like a glove to minimize any possibility of injury during a rough journey or an accident situation. In addition, some pet relocation services may have their own crate-sizing calculator to determine if your dog will be safe traveling with them. If you and your dog are involved in an accident, you want to be sure the crate can withstand the impact. Here, soft side dog crates are clearly out, as are flimsy plastic crates. We’ve written an entire guide on super strong dog crates. For maximum safety, focus on wire crates or very sturdy plastic travel crates. If the crate you are considering folds down, be sure there are locking mechanisms in place. 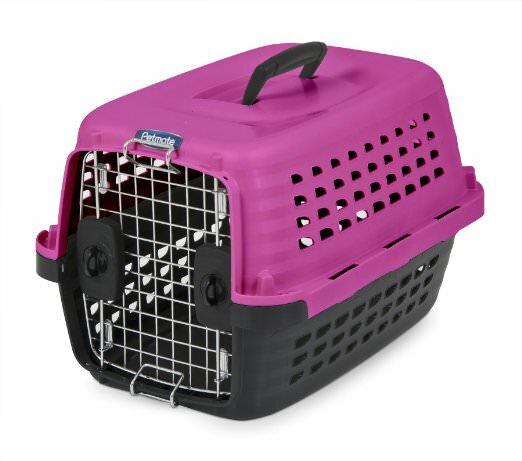 This is so the crate will not be able to collapse on your pet mid-trip or in case of an accident. Some crates are specifically designed for car or air travel. Those designed for the car often feature a loop to feed a seatbelt through. Those designed for airline cabin or cargo travel will carry an IATA/LAR (International Animal Transportation Association’s Live Animal Regulations) certification seal. 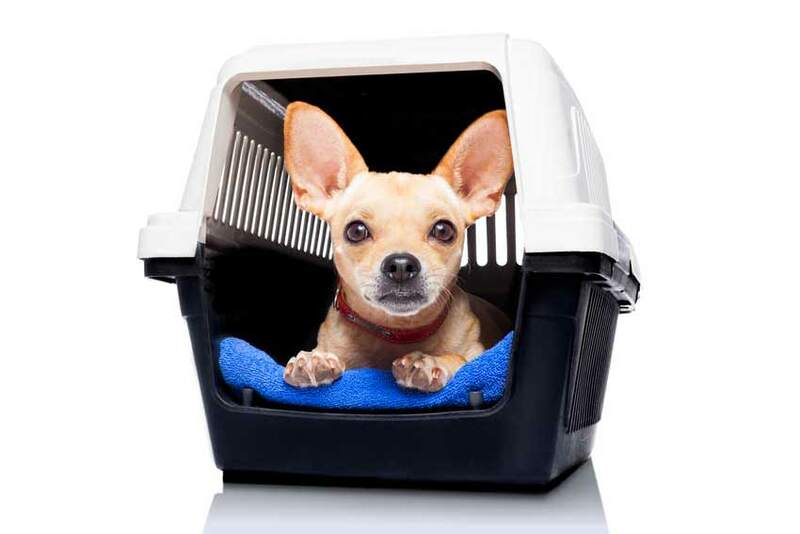 When purchasing a smaller crate for travel than what your puppy or dog is already used to, you will want to do this in advance to get her acclimated to the new travel crate before the trip. You can use the same principles you used for crate training her in her at-home crate to get her used to the travel crate. If your dog is a “short-headed” or “brachycephalic” (i.e. bulldogs, pug dogs, Boston terriers, et al) and you are traveling by air, you should check in advance with your carrier to find out if these breeds are even permitted to fly. If your carrier does permit them to be transported, you will likely need to buy a travel carrier one size up to be sure your dog has access to sufficient oxygen reserves at higher altitudes. choosing a quality crate keeps your dog safe. Plastic crates are generally the most common for travel. 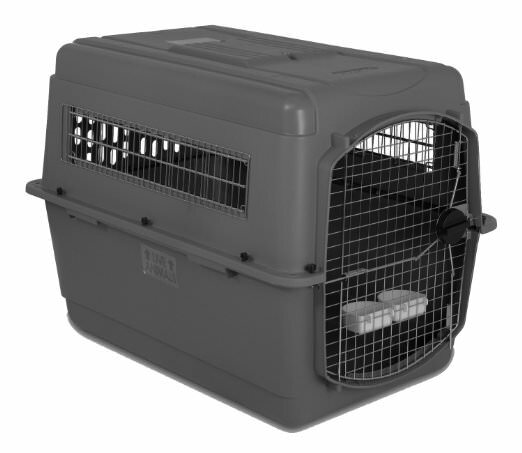 Petsmate’s airline-approved plastic kennel comes in 6 sizes and features a unique 4-way ventilation to keep your dog calm and cool during flight. The choice of six sizes goes back to what we referenced earlier in choosing the exact right size for your dog. It comes with “Live Animal” stickers and clip-on water bowls. The IATA regulations require that if you are doing air travel with your pet, you are required to have food and water dishes. Often, when one of us here at animal hub is traveling with a pet, we will put the water dish in the freezer the day before so that the water lasts longer. Your dog might not eat and drink right away on the flight until they get comfortable. The plastic and steel wire is heavy duty and the wing nuts are non-corrosive plastic. This safe and comfortable dog kennel meets the IATA/LAR requirements for air travel. dog is flying in the cabin with you, not if he is traveling in cargo. This is a soft side carrier that is offered in 3 colors: spinach green, rose wine, and mineral blue. 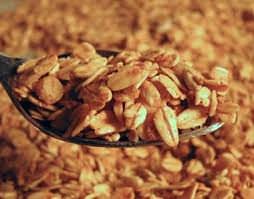 You can also find it in three sizes: small, large and large. All three sizes have wheels on the bottom for ease. Bergan’s comfort carrier is airline-approved for in-cabin air travel. The carrier can only accommodate puppies or small dogs up to 22 lbs. (in large) or 10 lbs. (in small). There is also a pull strap that converts into a shoulder strap for different kinds of transportation options. 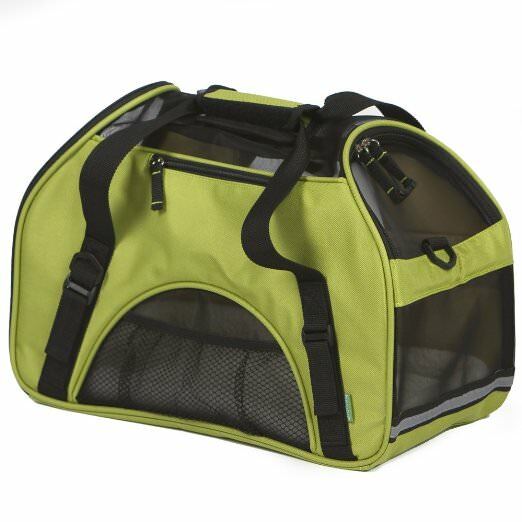 This carrier gets high marks from pet owners and comes with a comfy fleece travel bed to keep pets at ease during travel. Many people use it if you are going to be driving with your dog in the car on the seat next to you. a soft-sided crate is a convenient choice. If you are a new dog parent, you probably feel you’ve just been tackled by dog crate information overkill. But with some research, a little patience (and a tape measure), it won’t take long to pick out a great dog crate – we promise! NextWhy Dog Puzzles Are The Perfect Replacement For Rawhides! 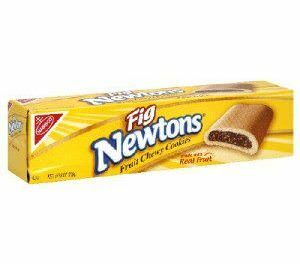 Can Dogs Eat Fig Newtons?